Cape Corse Castle was built by the Swedish Africa Company in 1653. At that time, the Swedes were most interested in lumber, gold, and pepper and their representatives negotiated with the king of Efutu for the land on which to build their outpost. Although it was a small kingdom, Efutu controlled the Gold Coast—modern-day Ghana. Because of its strategic location, the outpost was fought over by various European nations, including the Danes and the Dutch, but it was seized by the British in 1664. During the eighteenth century, the slave trade took precedence over all other European-African commerce and the British expanded the fort seaward and landward into a massive structure. Storage facilities were built to hold trade goods that were waiting for markets to open or improve, and an underground prison was excavated to hold Africans waiting to be shipped to the Americas as slaves. When merchant slavers anchored beside the fort, thousands of Africans passed through the dungeon’s exit gate, known as the “Door of No Return,” boarding the ships for an unknown and often swiftly fatal future. Forts like these were scattered all along the West African Coast, occupied by representatives of the various European trading companies. These men, known as “factors” were in charge of developing trade with nearby Africans and keeping other Europeans out—essentially price-fixing. Their success was mixed. African merchants felt no compunction about seeking their own best prices for selling slaves and purchasing European goods. They often pitted the Europeans against each other or simply moved their merchandize from a port that was heavily controlled to one that was not. Additionally, not all factors proved loyal. Not only did they make their own “under the table” deals to improve their status and comfort, they often started families with African women and had children who grew up to be bi-lingual traders whose success rested on their equally profitable European and African connections. 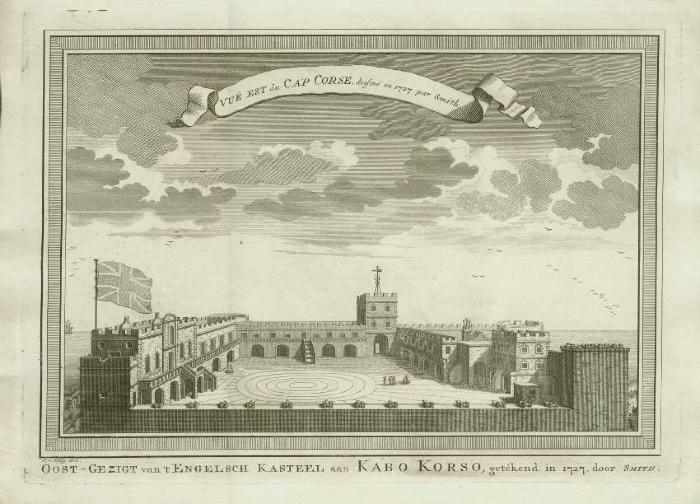 Once the British abolished the slave trade in 1807, Cape Coast Castle became a center of colonial government and remained in British possession until Ghanaian independence in 1957. UNESCO has designated it a World Heritage Site.